The Mako Shark concept car is finished in a varicolored paint scheme based on an iridescent blue upper surface that blends into a white side and lower body, like the natural coloring of the shark Bill Mitchell landed. 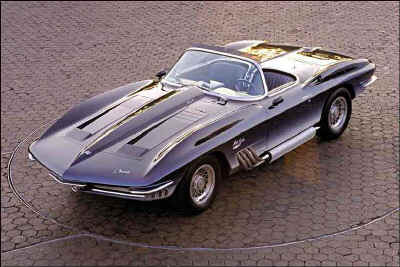 The present engine is a production 1961 427 cubic inch ZL-1 Chevrolet V-8. This engine has an all aluminum block, heads and intake manifold. It is equipped with a single four-barrel carburetor that produces upwards of 425 horsepower. The Mako Shark is presently part of the Vintage Concept Car Collection owned and cared for by the General Motors Design Center.